Seth Owen, left, and a friend on graduation day. 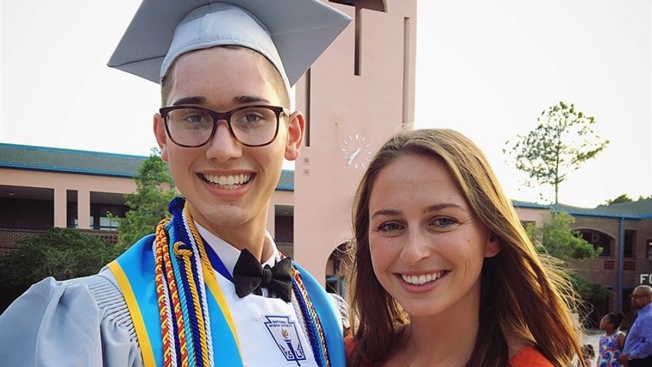 After raising nearly $130,000 to cover tuition, the gay Florida valedictorian who says his parents kicked him out will pay nothing to go to college this fall. News outlets report Georgetown University adjusted 18-year-old Seth Owen's financial aid package, reducing his expected out-of-pocket contribution from $20,000 to $0. His aid package had been calculated based on his parents' ability to pay. But he says they kicked him out in February, following disagreements over his sexuality and an ultimatum: attend their Southern Baptist church or leave. Having initially refused to adjust aid, Georgetown has now enrolled Owen in its scholarship program. Georgetown released a statement Friday in which Owen says he hopes to use the GoFundMe set up by his biology teacher to create scholarships for LGBTQ students facing similar circumstances.